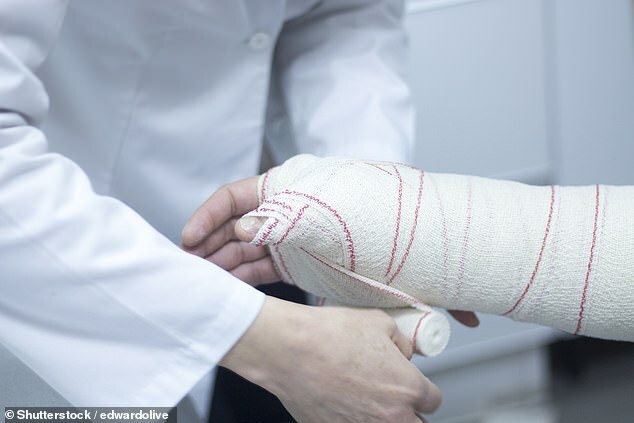 Scientists have created a ‘bio-scaffold’ that could speed up the healing of wounds. In a world first, the researchers designed materials that ‘talk’ to the body’s injured tissue to support its repair through every stage of the healing process. Known as traction force-activated payloads (TrAPs), the scientists believe the technique will have ‘far-reaching uses’ on everything from broken bones to diabetic foot ulcers. TrAPs were designed by scientists at Imperial College London in a study led by Dr Ben Almquist from the department of bioengineering. While collagen sponges are already used on burns and scaffold-like implants help to strengthen broken bones, the researchers felt a material should be created that met the changing needs of damaged tissue as it goes through the healing process. ‘Our technology could help launch a new generation of materials that actively work with tissues to drive healing,’ Dr Almquist said. Writing in the journal Advanced Materials, the researchers first drew on the body’s natural repair mechanism, which see cells ‘crawl’ through collagen ‘scaffolds’ in a wound. Pulling on these scaffolds activates healing proteins that begin the repair process. To recreate this, the researchers folded DNA segments into 3D shapes, known as aptamers, that cling to proteins. When analysing the speed a wound heals, scientists were surprised to discover recovery is faster during the day than at night-time. The pace cuts and scratches heal is thought to be controlled by the body’s ‘master clock’ in the brain. The researchers, from the University of Cambridge, expected recovery to largely take place during sleep, as this is when the body recharges. However, they believe their findings actually demonstrate an evolutionary advantage, with wounds healing faster during the day as this is when they are most likely to occur. Writing in a study released last November, the scientists believe this could open up a new door of medical treatments, such as scheduling operations so they occur when the body’s recovery mechanism peaks. The scientists then attached a ‘handle’, with one end being for the cells to ‘grab’ onto and the other to be fixed to a collagen scaffold. When tested in the lab, they found cells pull on TrAPs as they crawl through collagen scaffolds. This caused the TrAPs to unravel and activate healing proteins. By changing the ‘handle’, the researchers could alter the type of cells that pull on the TrAPs. As a result, different healing proteins can be released based on what the cells are doing at a specific time. ‘TrAPs provide a flexible method of actively communicating with wounds, as well as key instructions when and where they are needed,’ Dr Almquist said. ‘This intelligent healing is useful during every phase of the healing process, has the potential to increase the body’s chance to recover, and has far-reaching uses on many different types of wounds. The researchers also claim the technique could be adapted to help heal different cell types, such as scar tissue after a heart attack and damaged nerves. They add TrAPs are relatively straightforward to make and could therefore be produced en masse in different labs. Aptamers – which are already used in drugs to bind molecules together – have proven safety in humans and therefore may be readily approved for use in ‘bioscaffolds’, the researchers hope.